Castleford Tigers boss Daryl Powell has decided to concentrate on coaching the Super League club after turning down the chance to take on a role with England. Powell is interested in coaching England, but reckons this is not the right time to join the international set-up. The 52-year-old former Great Britain international was sounded out to work alongside England head coach Wayne Bennett for the next two years before taking over from him. Bennett will continue as England boss for two more years after his new contract was confirmed this week, but Powell will not be his assistant. 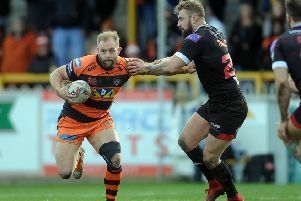 He confirmed he spoke to Rugby Football League’s rugby director Kevin Sinfield, whose recommendations on the coaching set-up were accepted by the governing body, but had turned down a job offer. Powell said: “I had a conversation with Kevin but at this point it’s not the right situation for me. “I’m pretty happy doing what I’m doing here and I need to focus on what we need to get right here. “Ultimately, at some point in the future, I’d obviously like to coach England. “It just wasn’t right for me at the time. “It’s about what we do now from here this season. I always wish England all the best obviously.